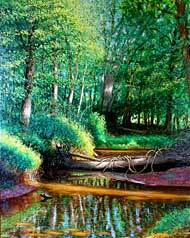 The Hyattstown Mill Arts Project is located on the edge of Little Bennett Regional Park in upper Montgomery County Maryland. 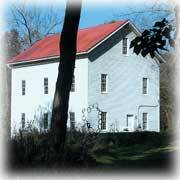 The Mill Gallery is normally open weekends from 10:00 to 4:00 and other times by appointment. Exhibitions of sculpture, paintings, prints and other fine arts as well as literary events are presented April through October. The mill, including the surrounding grounds and gallery offers an informal and rustic setting in which to hold meetings and other activities. Tours that emphasize the history of the area and or the operation of mills in the 1800s or tours related to the fine arts such as printmaking, sculpture, painting and drawing, may be arranged by calling the HMAP office. Groups from history or art classes at schools and summer camps are welcome and encouraged to visit. You can find us on Hyattstown Mill Road off Md. Rt. 355 at the lower end of downtown Hyattstown. From Rockville, Montgomery County and points south AND from the City of Frederick and other locations in Frederick County and points north, take Interstate 270 and then the Hyattstown exit. Coming from the south, turn left onto Md. Rt. 109, from the north, turn right, and proceed about one quarter mile to Md. Rt. 355, Hyattstown's main street. Turn right onto Rt 355 and then left beside the fire station onto Hyattstown Mill Road which is also an entrance to Little Bennett Regional Park. We are a few hundred yards in on the right. Give us a call and come visit.